Hi everyone! 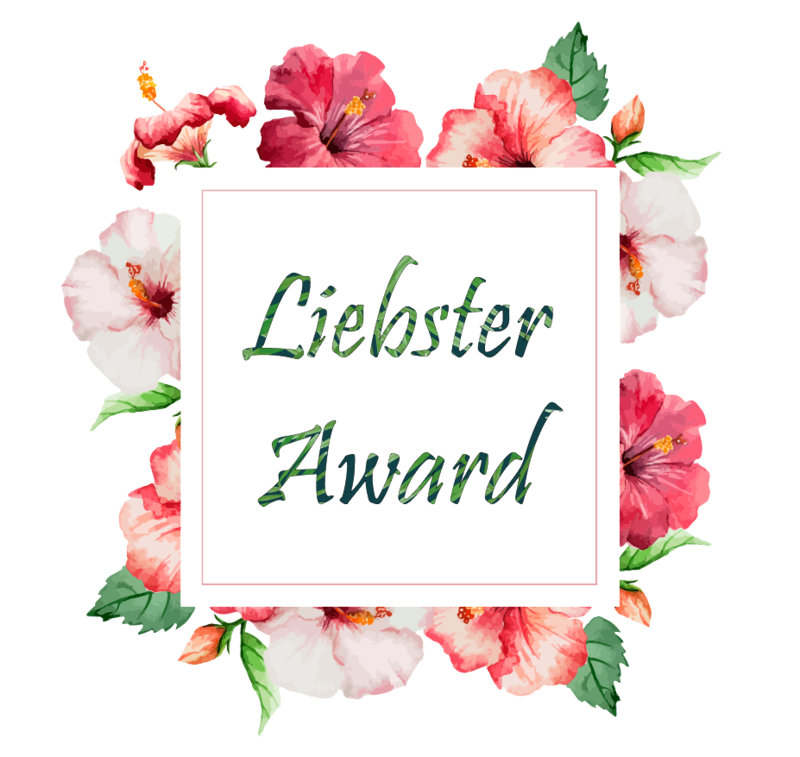 I just got nominated for the Liebster Award! Alright. Let’s get to the Q & A’s. I actually didn’t even think about blogging when I first started my website. Originally, I had the intent of starting an online business and WordPress was free so that’s who I went with. After I set the website up, I found the blog option on the site. When I made my first post, I discovered a whole community of Christian bloggers who love a lot of the same things I do. So, I guess…it was an accident that I found blogging? But blogging for me is a really great way to unwind and write (while my novel sits and waits and pleads for me to edit it) In essence, blogging gives me a platform for receiving writing input, ideas, and encouragement from other Christian bloggers. I write to learn so that’s why I keep blogging! I came to know him when I was ten at a Christian horse camp. My counselor told me what I needed to do and I truly believed there was a God and that Jesus Christ had died to save us from our sins. It was a wonderful day. Today, I still hold to that faith and will never let it go. Well, not exactly. It’s not that strange I promise. I find joy in watching them listen to instruction and then remembering that instruction. When they complete a move correctly or even try to complete it, it makes me happy. I love jiu-jitsu and I love my siblings (even though I don’t always act like I love them. God is still working on my tongue and attitude towards “siblings and their petty annoyances”) so joy comes naturally when those two are combined. Oh I can tell you that right away. First off, fresh garden salads; leafy baby spinach and lettuces with fresh tomatoes and carrots and onions. Second, home raised chicken smothered in butter and homegrown herbs. Third, home grown potatoes garnished with homemade goat cheese from our goats, freshly cut chives, and goat milk and kefir ranch. Ahhhh…sooooo delicious. I could rave all day. Oh…but a meal should have a little something sweet too. Perfectly chocolate chocolate cake set in a bowl of homemade goat milk ice cream. Ahhh….now that is something I can’t live without. I think God gave me the gift of art. Writing, music, and drawing. I say that in the humblest way possible and I believe I have those gifts because I love all of those things and I have come to use them for God’s glory over the years. Slowly and surely, I am gaining in confidence. Speaking up about my faith is hard because I am afraid I will say the wrong things and turn others away instead of towards God. But with the gifts he has given me, I am finding it easier to share God’s love with others. Singing and playing violin at church are one example. I am very passionate about music. I believe God has given me music so that I can go and bless others with the beauty of sound as well as using it to connect with other musicians who are not believers. I believe God gave us all gifts and talents for certain purposes and when we use those gifts to share the gospel, heaven rejoices. Rabbit trail…….Imagine what it must be like to hear the angels sing? If we melt here when we listen to an angelic choir, some young soprano singer, or hear classical music, what must it be like to listen to the music of heaven? Writing notes, letters, and stories for others who need a friend or who are just falling away in their faith or need encouragement happens quite often for me. I have felt God’s call to do this so many times and writing novels and short stories I believe are his calling for me. Sure I love writing and stories in my own little way, but I think God gave me the gift of storytelling. It might not be up to the world’s standards but it is up to God’s standards. Little stories told to lonely, scared, and restless girls and boys are wonderful opportunities to share God’s truth. Someday, when my novels are published, I have a feeling God is going to use the things he’s taught me to show someone else his never ending love. Drawing with children and others who think that they will never be good at anything has been a recurring thing for me. I work at a summer camp and a lot of the girls who come like to draw. Often they come up to me and compliment me on the drawing I drew during chapel. (I was listening to the speaker, I promise. Drawing helps me focus) They say they wish they could draw and I always tell them the same thing. “Drawing takes practice and over time your drawings will get better, but never be discouraged with how they turn out.” This leads to the topic of drawing and painting and then before I know it, I have a fan club and the perfect opportunity to share Christ’s love. In our times together, I show them drawing tips and tricks and often at the end of the session, they have a renewed self-esteem. I show them simple exercises that help make their eye drawings more realistic and how to shape the heads of their horses. Almost every time at the end of the week camp, the girls have drawn me a large stack of drawings. I still have them and will go through my box of letters and pray for their dear little souls. Just talking with the girls and using drawing as a way to connect and show Christ’s love is a gift I believe he has given me. I’m no drawing expert but I am at the level where I need to be to share artistic knowledge as well as hope and truth in Jesus’s name. There are so many of them and many are unrecognized. (Not that they want to be recognized and upheld and popularized by humans. I think they want their work to be inspiring and motivating but not to be something that gives them the glory. After all, God was working through them. They were only the tool. ) The one missionary that inspires me the most is Paul. 2 Corinthians 11:16-33 is where Paul talks about being beaten, whipped 39 times, imprisoned, stoned, and so much more. If you read through Acts, his missionary journey just keeps going , even through all those trials. The zeal he carries and the love he has for God is so strong. I just marvel at that and pray and hope my faith can be made stronger. I would have to say it was at a time when I was working at a summer camp. One of the other counselors in my cabin had been questioned by a camper and it was such a big question that we went past lights out to explain it. Everyone was listening and hungry for answers. I could feel God then. It was very peaceful. One of the campers had asked, “How do you know God is real?” The counselor had replied. “Because the Bible says he is real and the entire creation shows and sings of his glory.” It only got more and more in depth until my counselor had told her and the entire cabin her life story that showed God’s hand immensely. I enjoy grappling with people, choking my friends, doing armbars, finishing ankle locks, and taking people to the ground, all in fun. This sounds and looks really weird typed up but I promise I’m not crazy. If you want to know more about Brazilian Jiu-jitsu please ask and I will explain. Maybe all this won’t sound so strange and horrific to you all. I can hear you now. “What? A Christian girl blogger who likes to choke people??!!! For fun? ?” Guys….relax. I do it only at my academy and no one gets hurt. We have a system. Ask me about it. Please. I sing Italian, German, and Latin opera songs (or try to) when I think no ones listening. I have dreams about flying while saving newborn babies from strange villains quite regularly. I’s so strange, but I always win in the end. All my books, no matter what they are, collaboration projects with friends or just short stories and novels all have one thing in common: They have some sort of fantasy element. I cant refrain from keeping anything normal. An ordinary western/action/romance book with a friend has now turned into a Christian/time travel/fantasy/cyborg/ romance book. Oh dear. I call myself and introvert but I took a quiz and it said I was very extrovert. My friends say I’m introvert. My siblings say I’m both. My cousins can’t decide (I think) so I am at a loss. What personality am I? Now it is time for the nominees….This is so hard. If you had all the Legos in the world to build with, what would you build first? Would you prefer having tea or coffee with talking red foxes or with talking deer? What is one character flaw you hope will someday be a thing of the past with God’s help? What is one animal you dream of owning? Would you rather fill a journal with only drawings or fill a journal with only poems? If you had everyone’s attention in the whole world and they promised to listen to you for one hour, what would you tell them? Next Post Brazilian Jiu-Jitsu: Is it a Discourse Community?